As one of the greatest smash hits of recent years, it's no wonder that Game of Thrones has been snatched up by Microgaming for its heart-stoppingly exciting new video slot. Fans of the show will love this five-reel game full of characters, graphics and features based on the epic HBO series. It’s time to head to Westeros and pledge your allegiance to your house – but first, read through our slot review for tips and tricks on how to play. For those who aren’t familiar with the TV programme (where you have you been? ), Game of Thrones sees several rival noble families battling for control over the mythical lands of Westeros. Featuring battles, politics and plenty of skin, it's become a massive hit across the world. The show is based on a series of fantasy novels by George R. R. Martin and now the franchise has expanded into the world of online casinos with this offering from Microgaming. Fans of the show will instantly recognise the epic theme tune that plays during the base game, as well as the background design that resembles the title card of the TV series. The reels are quite plain with the symbols consisting of card ranks from Jack to Ace, the four houses represented in the game, plus the wild and scatter symbols. There are two versions of the Game of Thrones slot: one with 243 ways to win where the betting ranges from 30p to £3 per coin, and another with 15 paylines where the minimum bet is 15p. Be sure to check which one you’re playing when you open it up as some casino sites only offer one. All you have to do it set your coin value and number of coins, then you’re off. There’s also an autoplay function that'll set up to 100 spins to run automatically. The four houses are the high-value symbols in Game of Thrones, with House Baratheon paying out the most. The TV series is full of drama so it’s only fitting that the online slot has some exciting features to keep players on the edge of their seats. 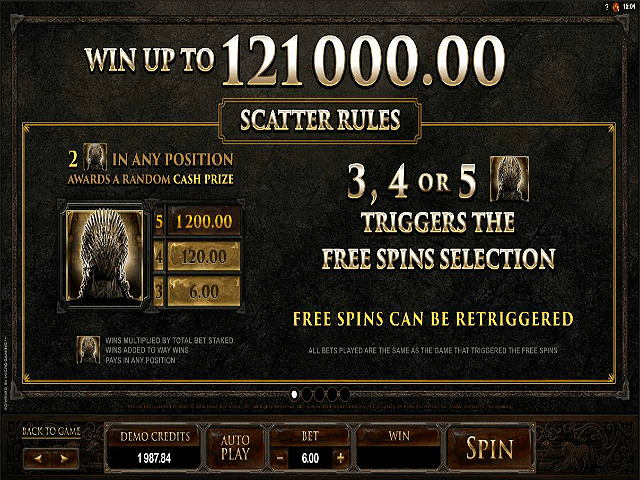 The main feature is free spins, which is triggered when you land three or more scatter symbols, but there are four free spins games to choose from based on the four houses. The House Baratheon game awards you with eight free spins with a 5x multiplier, as well as three Baratheon scatter symbols. 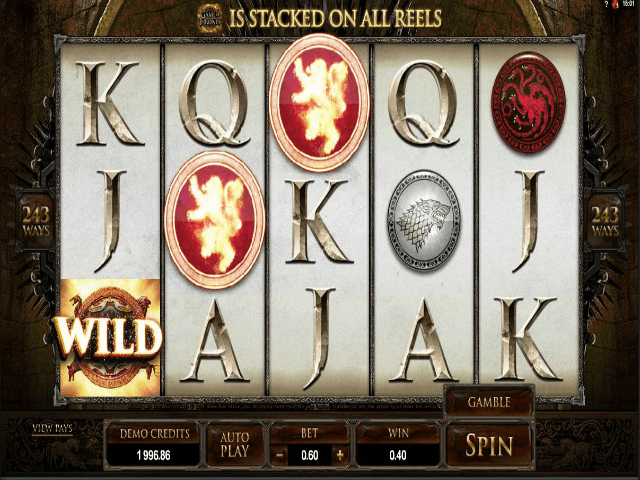 House Lannister gives you ten free spins with a 4x multiplier, with the Lannister symbol stacked four high. Head north to House Stark and you’ll get 14 spins with a 3x multiplier and five-deep stacked symbol. 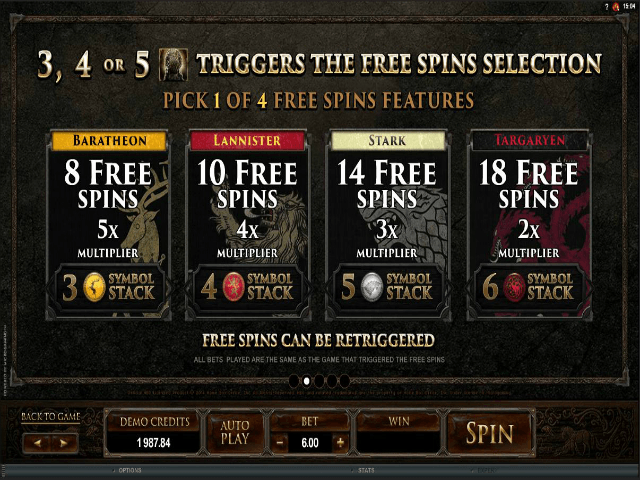 Finally, there are 18 free spins with a 2x multiplier to be had with House Targaryen, plus a six-deep stacked symbol. Free spins can also be retriggered during the feature. Should you only get two scatter symbols, you’ll be awarded a random prize multiplied by your stake, which is a nice consolation prize for missing out on the free spins. Finally there’s the Gamble Trail feature, which appears after each win. You’ll be asked to call heads or tails and each successful flip will double your winnings and progress you to the next stage. There are four locations to journey through in total, with each one accompanied by real clips from the show. 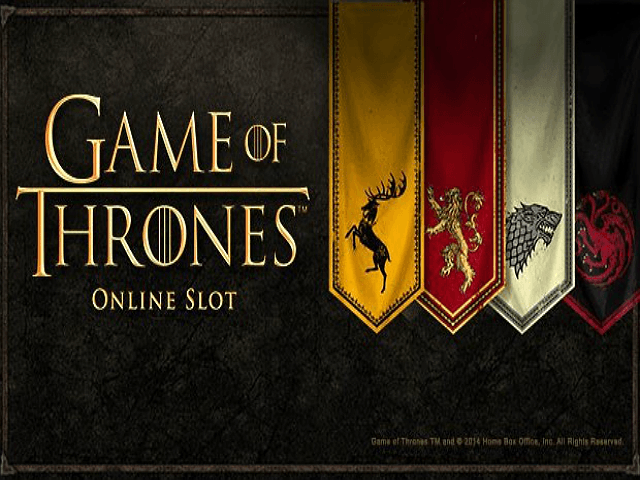 In short, Game of Thrones is an awesome slot inspired by one of the most action-packed and highly anticipated TV shows of our time. Spin the reels and, if you're lucky, you might just break your way into the Iron Bank. 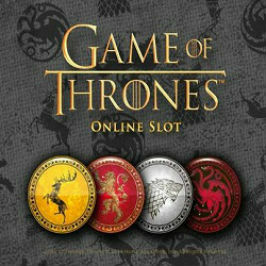 If you like Game of Thrones - You'll like these slots too!